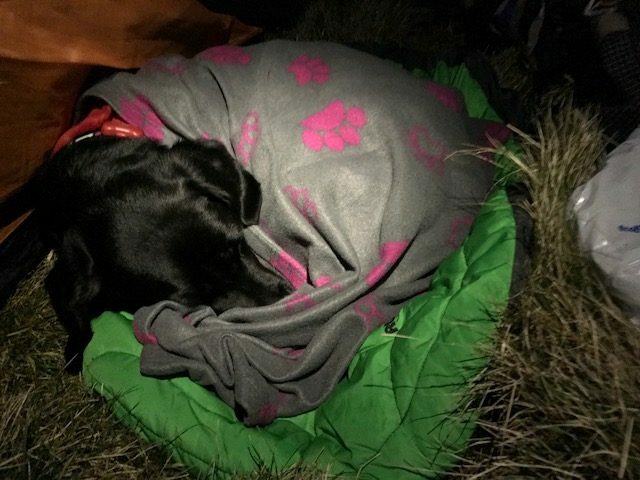 A quick post on my first overnight trip of the year, with Rosie in tow or rather Rosie towing me! Parking at Pistyll Rhaedr waterfall we headed north up the valley and into the Berwyns. 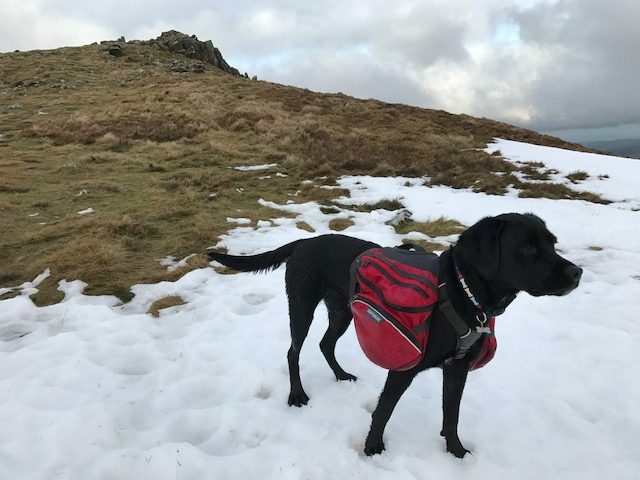 Rosie was wearing a loaded pack for the first time, proudly carrying her own food in her Ruffwear Palisades pack. It didn’t seem to slow her down as she chased imaginary sheep as if she were possessed! ,As we gained the main ridge snow patches were still apparent. A cornice still clung to the steep wall above the lake. Mystified by this strange white stuff Rosie jumped and hopped around, confused by her sinking feet. A stiffening breeze accompanied the moody views from Cadair Berwyn’s summit. 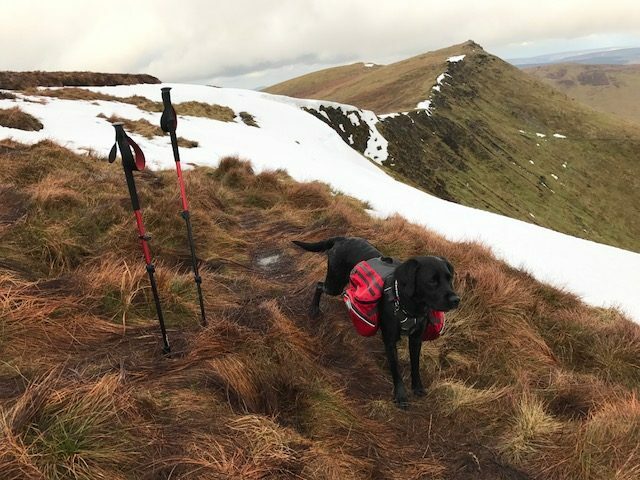 My circular route would see me drop east off the main ridge before Bwlch Maen Gwynedd – the col just before Cadair Bronwyn – and head over the pathless bog and tussocks of Tomle and Foel Wen indistinct summits. Keeping an eye out for a suitably flat and sheltered spot I continued heading east without success. The sun had already dropped below the main ridge behind me and the wind was becoming stronger. Scouting around a few rocky outcrops I resorted to what appeared the only relatively flat patch on which to pitch my SL3 shelter, but with little shelter from the breeze. Night quickly feel and couped up I concocted a fine fayre of chilli tuna and chorizo with my 50p packet pasta. It’s been a while since I’ve used pre-packaged de-hydrated meals, preferring the satisfaction of mixing and matching off-the-shelf ingredients and saving money as well. Tired after her exertions Rosie soon snuggled under her blanket. Her constant running and exploring means she likely does twice my distance so she’d easily broken her FitBark record with 33,000 points for the day. .As the temperature dropped I was thankful for the comfort of my new As Tucas Sestrels pants and Goosefeetgear down socks and overshoes to keep me toasty. 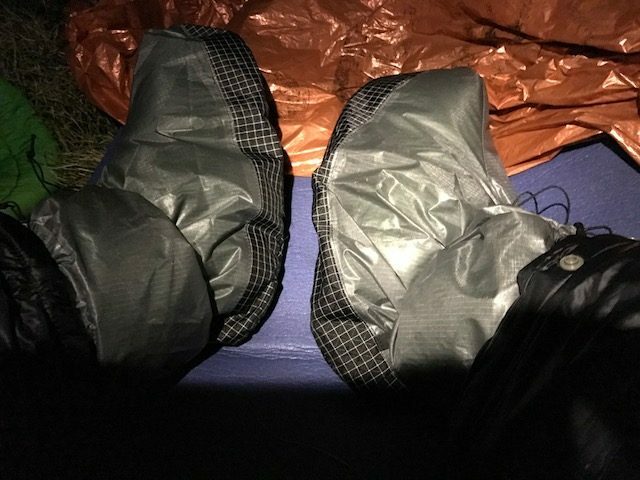 The Sestrels pants are super-smooth and comfy and the overshoes were handy for heading out for a toilet break, being somewhat more robust than the food bags I normally use. The Increasing wind made for a rather restless night as my flysheet rumbled with each gust. Visions of another ‘accident’, my centre-pole having previously been pushed through the fly-sheet of my old Hex Peak, gave rise to thoughts of evacuating down into the valley. Morning eventually came but I opened the shelter door to a sea of grey. Visibility was down to around 10 meters as I packed a soaking fly-sheet. I admit to relying on Viewranger on my iphone (I did have map and compass as a back-up!) to traverse down to lower ground, before picking up the path down into the valley at Ten-y-ffridd. Crossing the river I climbed back up heading south-west through a plantation before dropping back down to the single-track road that leads back to the waterfall at the valley head. Unfortunately I was 10 minutes late for the strict 11am watershed for ordering a bacon roll at the cafe. My look of distain clearly had no effect and so a toasted tea-cake made a poor breakfast substitute! It was a quick trip over all to quickly. 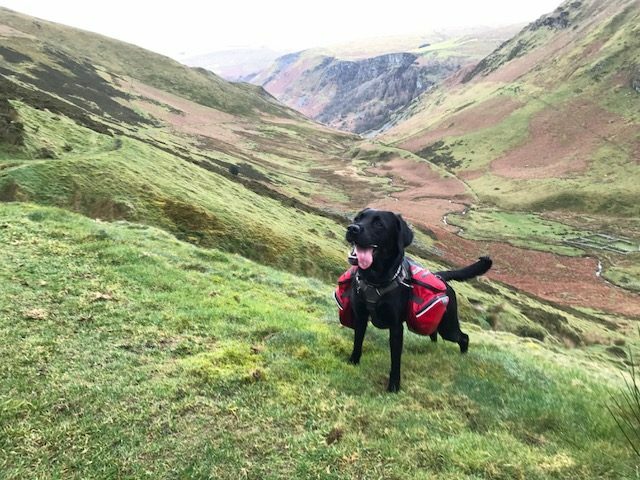 It was still good to get out and blow away the cobwebs, even though I’d probably spent more time travelling in the car than I had in the mountains! 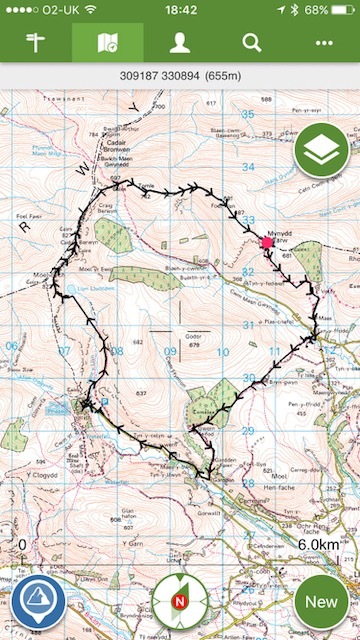 The Viewranger screenshot on the left shows our route in the Berwyns. We didn’t see another soul until we joined the road back to the waterfall.